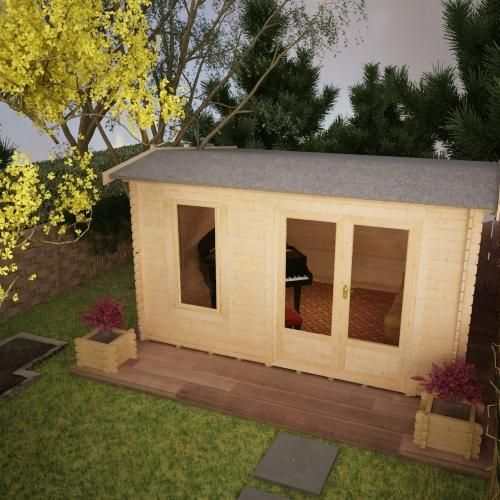 The Lavinia, made with Heavy Duty 28mm Tongue and Groove logs, is a Cabin built for every purpose. It can be enjoyed by kids and adults alike and makes a perfect addition to your home and garden. 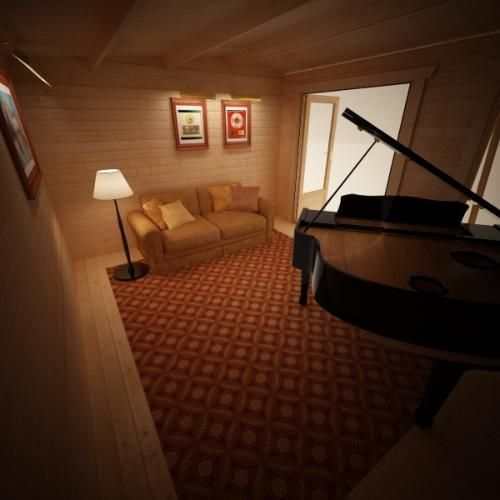 The full length glazed windows and doors allow for the cabin to be fully lit up during those warm summer nights. I'm not really one for leaving reviews online but I'm so pleased with the service I've had, I just wanted to say thank you! The Cabin is excellent quality. 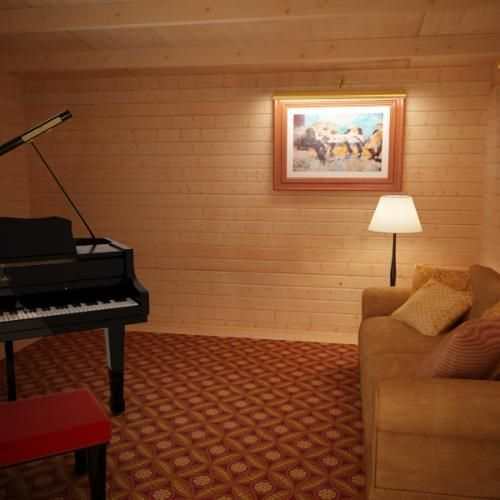 I've been to quite a few Log Cabin sellers as I wanted to make sure I was going to get the best for my money and I have no regrets for choosing Tiger in the end. 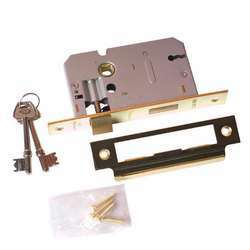 Staff have been helpful throughout the ordering process, I was kept up to date on the stages of the order, and I received a call a few days before the delivery to confirm not just a full day for delivery but an actual arrival timeslot. Brilliant! This meant I could plan my day off and make the most of my time. I admit I did need some advice when putting it together but I called them and got answers to my questions straight away. 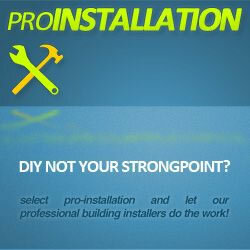 I've already recommended you to a few friends and family and will continue to do so! Well done Tiger Sheds. Wanted a cabin which was spacey and let in a lot of light as I was hoping to transform it into my own home office. After seeing this product on the Tiger Sheds website I knew it was the product I was seeking. I have not been let down either! Looks fantastic in the garden and inside there's so much light it makes a very inspiring place to work. Good work!! Wow very impressed with how this cabin looks now erected! Not yet finished but so excited! Delivery was faster than i expected and Tiger Sheds have some really friendly staff which go out of their way to help out! Very happy customer. Lovely product, great staff and loved loved the delivery driver as he was so kind and a pleasure to speak to first thing in the morning. Great product! Was impressed with the helpful staff and delivery driver. Great company! 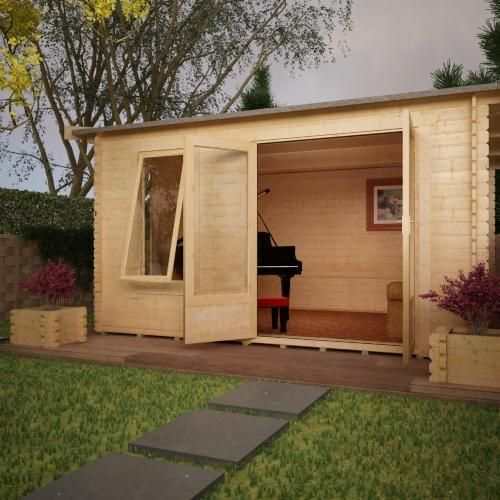 The Lavinia, made with Heavy Duty 28mm Tongue and Groove logs, is a Cabin built for every purpose. It can be enjoyed by kids and adults alike and makes a perfect addition to your home and garden. The log thickness means that heat is retained exceptionally well in winter, while the full length glazed windows and doors allow for the cabin to be fully lit up during those warm summer nights. 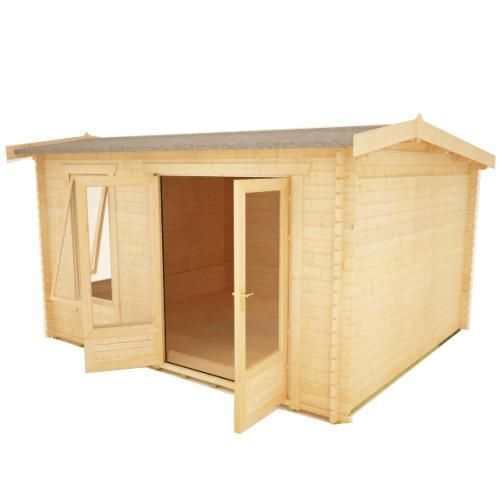 Unlike many budget competitor products, Lavinia Log Cabins are built with only the highest quality materials and many log cabins in the market simply cannot compare! 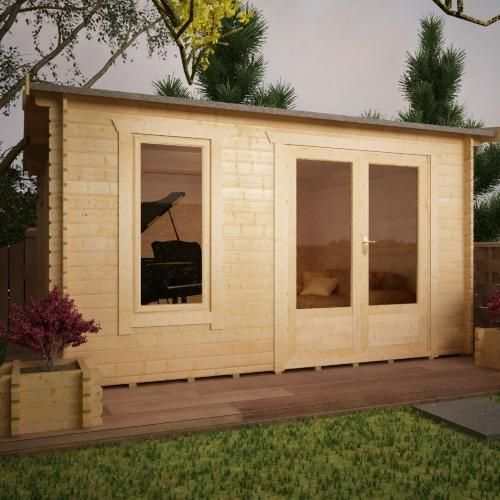 LAVINIA LOG CABINS feature high-grade 28mm interlocking planned and finished logs – beware of log cabins that feature rough edged boards machined from poor quality timber. LAVINIA LOG CABINS feature a specially designed 4-way chamfered notch-joint system ensuring a tight fit to all boards with little room for damp or wind penetration – beware of log cabins that feature square cut logs with square notch-joint, often leaving a sloppy joint with large visible gaps. 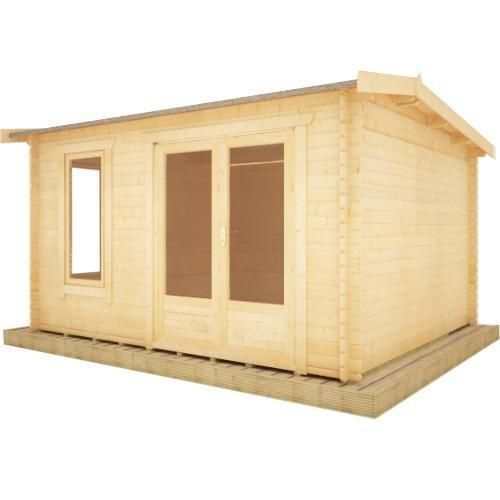 LAVINIA LOG CABINS feature factory fitted pressure treated weatherproof heavy duty floor joists – beware of log cabins with untreated floor joists which offer no protection against damp penetration at floor level or worse still cabins that come with no floor joists at all. LAVINIA LOG CABINS feature heavy duty green mineral roofing felt as standard, with the easy option to upgrade to premium quality roof shingles – beware of log cabins that come with no roof covering, leaving the log cabin completely open to the elements. LAVINIA LOG CABINS feature oversized extra large doors and windows – most competitor log cabins use narrow doors which can prove difficult for access. 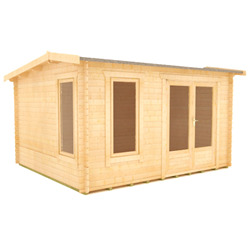 LAVINIA LOG CABINS feature key-lockable opening windows and all doors and windows are professionally draft sealed – beware of log cabins with cheap, ill-fitting doors and windows that cannot be properly secured and are susceptible to the weather. 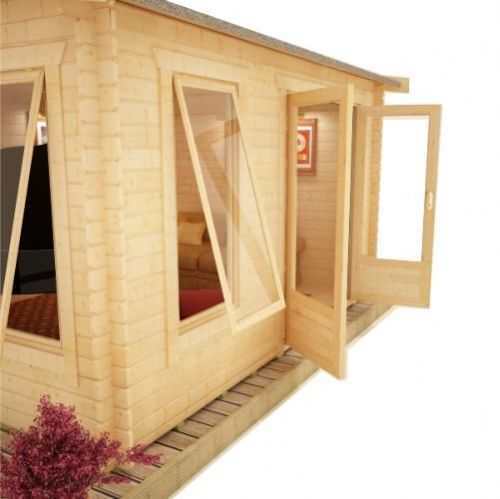 LAVINIA LOG CABINS feature high quality glazing which is factory silliconed and internally beaded to all doors and windows – beware of log cabins that feature lesser quality materials and provide no window beading. 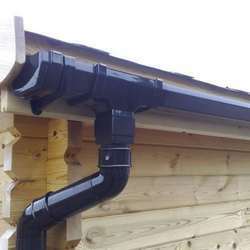 LAVINIA LOG CABINS feature a generous all round roof overhang which protects the building from severe conditions – beware of log cabins with little or no roof overhanging leaving them vulnerable to the wind and rain.